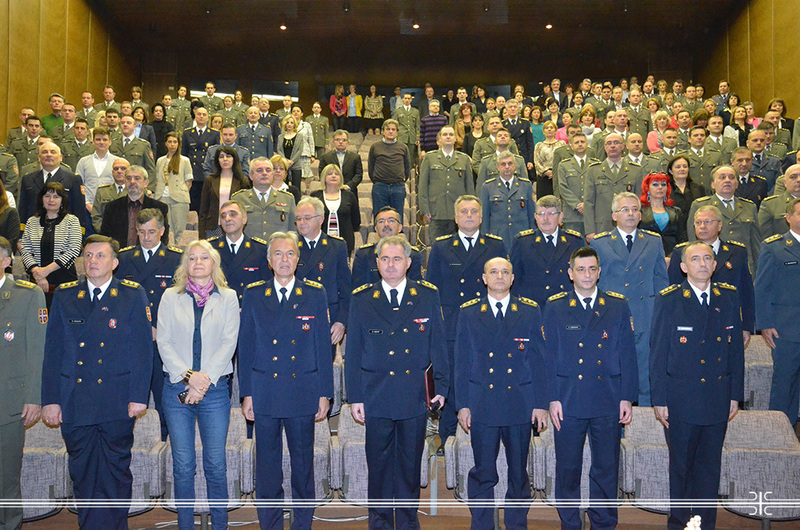 On the occasion of 23 April, the Day of the Serbian Armed Forces, a ceremony was held at the Military Medical Academy. The Acting Head Col. prof. Dr. Zoran Segrt congratulated the holiday to all members of the Serbian Armed Forces, Ministry of Defense of the Republic of Serbia and the staff at the Military Medical Academy. He said that the Serbian Armed Forces are one of the pillars of Serbian statehood, deeply embedded in the tradition of the Serbian people, and that the Military Medical Academy, as part of the SAF, had acquired the best achievements of military organization. Colonel Segrt congratulated all members of the MMA who were promoted in the military service, both in regular and in extraordinary procedure, as well as colleagues who were rewarded for their work in the period between the two anniversaries and expressed his confidence that they would hold ranks and awards with honor, as befits officers, non-commissioned officers, military officers and employees of the Serbian Armed Forces and the staff at the Military Medical Academy. On the occasion of the Day of the Serbian Armed Forces the renovated ambulatory care unit of the Clinic for Endocrinology was opened and the latest generation of the X-ray device was put into operation at the Institute of Radiology. Ultrasound examinations and fine-needle aspiration of the thyroid gland, peripheral circulation Doppler ultrasound are performed among other procedures. The new surroundings will provide better conditions for the treatment of diabetes, the disease which expansion takes elements of the epidemic, as well as other endocrine diseases. The new device at the Institute of Radiology is the ultimate diagnostic digital radiographic-fluoroscopic system that performs imaging with a significantly lower dose of radiation to the patient and the operator. It allows operation in many digital modes, including: radiography, serial radiography, fluoroscopy, pulsed fluoroscopy, linear tomography. Novelties will significantly help in improving the quality and promptness of treatment interventions at the Military Medical Academy.